Each year, we design and print a custom Christmas Card that we think not only shares a Christmas greeting but also conveys the pro-life message. After hearing rave reviews from supporters, this year we are making a limited number of the cards available to our supporters who would like to send a pro-life Christmas card of their own. This year, our car features a beautiful image of a pregnant woman kneeling next to a manger. The inside reads "Merry Christmas and a Joyful New Year." 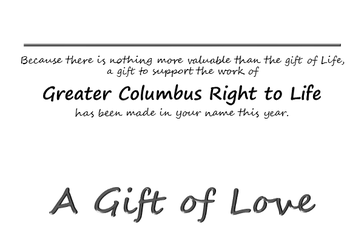 The reverse shares a message that the card was designed and printed to support the life-saving work of Greater Columbus Right to Life and an invitation to visit this website, where a special Christmas message will be released on December 1st. Note: Cards are printed on demand, so they should arrive to you about 7-10 days after ordering. 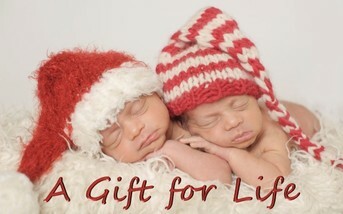 This Christmas, share your support for the cause of Life with these one-of-a-kind GCRTL Christmas cards. Our gift to you as a thank-you for supporting our year-end-appeal. To visit our secure, online donation portal powered by PayPal, just click the button the the left. You will be invited to make a gift (or gifts) in any denomination you desire. After you make a donation, you will be taken to a page where you can designate recipients, let us know how you where you would like the acknowledgement sent (to you, to the recipient, or to the recipient anonymously), or you can even print from home!